Move the height adjuster up as needed until you hear a click. Push the lock release button and slide the height adjuster down. Make sure the shoulder belt pass through the guide when using the center seat belt. ●Use a child restraint system appropriate for the child, until the child become large enough to properly wear the vehicle’s seat belt. ●When the child becomes large enough to properly wear the vehicle’s seat belt, follow the instructions on P. 61 regarding seat belt usage. Failing to do so may cause death or severe injury. 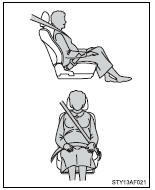 ●Do not recline the seat any more than necessary to achieve a proper seating position. The seat belt is most effective when the occupants are sitting up straight and well back in the seats. Do not allow children to play with the seat belt. If the seat belt becomes twisted around a child’s neck, it may lead to chocking or other serious injuries that could result in death. If this occurs and the buckle cannot be unfastened, scissors should be used to cut the belt. ●Do not place anything, such as a cushion, on the front passenger’s seat. ●Do not damage the seat belts by allowing the belt, plate, or buckle to be jammed in the door. ●Ensure that the belt and tab are locked and the belt is not twisted. Inappropriate handling of the pretensioner may prevent it from operating properly resulting in death or serious injury. ●Do not wear the seat belt extender, if you can fasten the seat belt without the extender. ●Do not use the seat belt extender when installing a child restraint system, because the belt will not securely hold the child restraint system, increasing the risk of death or serious injury in the event of an accident.